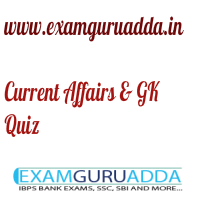 Dear Readers Examguruadda.in presents Current Affairs quiz of 29-31st December 2016 that cover important current affair events. Current Affairs quiz for IBPS PO,clerk, RRB-Po,Clerk, SBI, NIACL,Railways and SSC Exams. 1. Samit Gohel is associated with which sports? 2. The Chardham highway project will come up in which state of India? 3. India’s first caterpillar train will be set up by which state government of India? 4. India’s first Digi Dhan mela has been held in which state to promote cashless transactions? 5. Who has been appointed as the new Lt Governor of Delhi? 6. The book “Watership Sown” was authored by whom? 7. What does “BHIM” stands for? 8. How much loan amount has been approved by the World Bank for rural road projects in Bihar? 9. The book “That thing called love” has been authored by whom? 10. “Beipanjiang Bridge” the world’s highest bridge is in which country?